Home » Articles » Fashion » Make Your Feet Sing with Snazzy Socks! Make Your Feet Sing with Snazzy Socks! I recently watched a 5 minute interview with newsreader Jon Snow and found myself nodding in agreement with one of his statements. Jon was asked about his penchant for wearing rather loud ties and socks and replied that there is not much you can do to brighten up a suit but ties and socks are a few things that can help. The only other thing I can think of is a handkerchief and Otis Batterbee has quite a few to choose from. However by far the most versatile of the three are socks! Socks brighten up not only a dull grey suit but can add a zing to blue jeans and for those who insist on wearing socks with sandals at least make them bold! Luckily, for people like myself and Jon Snow, Lyle & Scott are launching two styles of socks, striped and solid, to their Vintage range in time for Christmas and I’m sure there will be a flurry of letters arriving at the North Pole with some adult handwriting proclaiming the writers have been good boys and requesting a few pairs or will I be the only one? 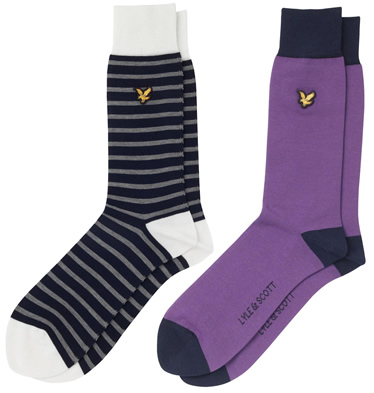 Of course it may well be that postal delays prevent said letters being delivered in which case it’s lucky that Lyle & Scott have priced the socks very reasonably at only £10 for the solid coloured ones and £12 for the striped. What’s more, those clever people at Lyle & Scott have only put their flying eagle motif on the left sock, so even if you’re nursing a headache from too much mulled wine, you’ll always know which sock belongs on which foot! 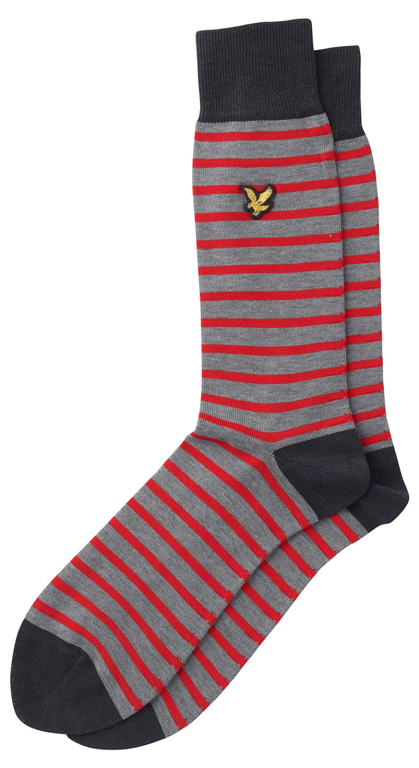 You’ll find the socks from December together with the rest of the Lyle & Scott range online at both www.lyleandscott.com and www.my-wardrobe.com as well as in-store at Lyle & Scott outlets together with some of the UK’s most exclusive independents and department stores. ‘Bold’ Mr.Fotheringham ‘Bold’? a gentleman should never and will never put these two things together,socks and sandals, No, No, No. Oh I agree, sandals and socks should never be paired together but there will always be someone who bucks convention and common decency. I merely suggest that I could forgive them their bad taste if they were to sport a pair of these socks. Plain not striped tho! And yes indeed, pairing these with a suit will mark you out as a gentlemen of character and confidence, on the outside people will see a grey or navy suit but the dash of colour that envelopes your feet will alert them to the fact that you are not just another drone in a suit but rather a force to be reckoned with!